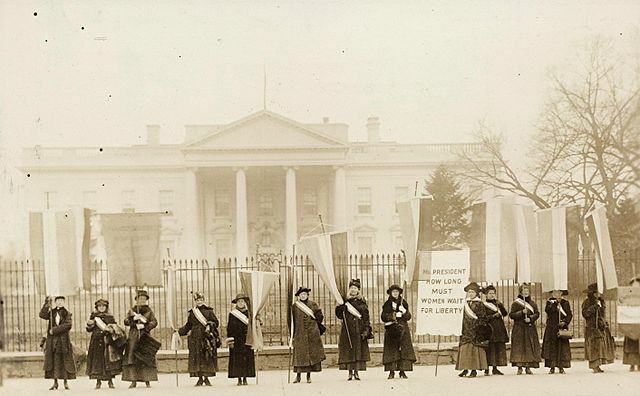 Introduction: The National Woman’s Party, representing the militant wing of the suffrage movement, utilized picketing and open public demonstrations to gain popular attention for the right of women to vote in the United States. 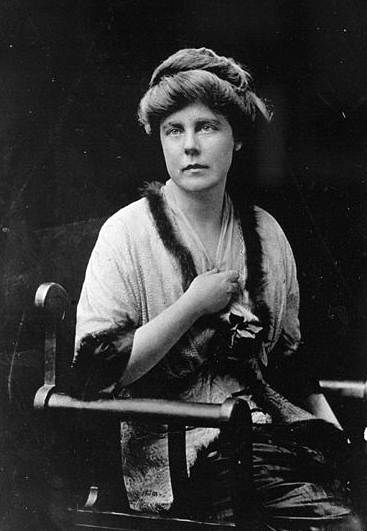 The origin of the National Woman’s Party (NWP) date from 1912, when and Lucy Burns, young Americans schooled in the militant tactics of the British suffrage movement, were appointed to the National American Woman Suffrage Association’s (NAWSA) Congressional Committee. Radicalized by their experiences in England–which included violent confrontations with authorities, jail sentences, hunger strikes, and force-feedings–they sought to inject a renewed militancy into the American campaign for woman’s suffrage. Their first activity on behalf of NAWSA was to organize a massive national suffrage parade in Washington, D.C., on March 3, 1913. The parade was modeled on the elaborate suffrage pageants held in Britain and local marches organized in New York by the Women’s Political Union (WPU). The March 3, 1913, parade coincided with President Woodrow Wilson’s inauguration and put the president-elect and Congress on notice that NAWSA would hold the Democratic Party responsible if it failed to pass a women’s suffrage amendment. Bands, floats, and more than 8,000 marchers participated, representing nearly every state and most occupations. 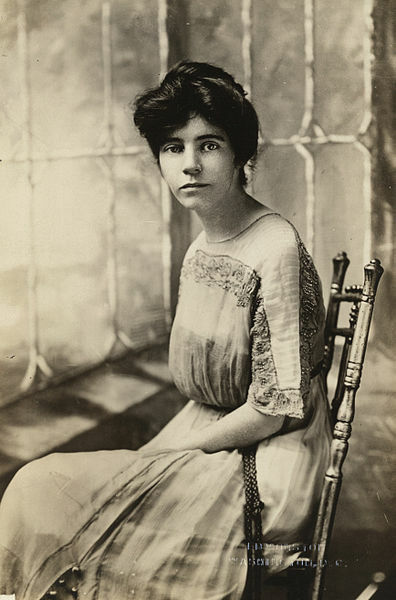 Dissatisfied with the leadership and direction of the NAWSA, in 1914 Alice Paul led a group of women out of the National American Woman Suffrage Association to form a new organization, the Congressional Union (CU). Its purpose was to put pressure on the Democratic Party, which controlled both houses of Congress as well as the White House, to secure the right of women to the suffrage. The CU organized and carried out an aggressive suffrage campaign. Its members held street meetings, distributed pamphlets, petitioned and lobbied legislators, and organized parades, pageants, and speaking tours. The National Women’s Party: In 1916, the CU was renamed the National Woman’s Party (NWP). In January 1917 the NWP began to picket the White House. The government’s initial tolerance for these demonstrations gave way after the United States entered World War I. The NWP highlighted the government’s hypocrisy of supporting democracy abroad while denying its women citizens the right to vote at home. NWP criticism of the government was viewed as unpatriotic by many and even seditious and subversive by some, especially the soldiers and sailors who were among the most visible instigators of mob violence against the pickets. The NWP firmly defended the rights of free speech, free assembly, and dissent. NAWSA’s President publicly disassociated her organization from the NWP’s “unladylike” behavior and the “unwelcome” publicity it generated, although NAWSA benefitted by appearing more moderate and approachable to politicians who were beginning to rethink their anti-suffrage positions. On June 22, 1917, suffrage pickets began to be arrested on the technical charge of obstructing traffic. As the summer progressed, more arrests followed and longer prison sentences were handed down. The women were imprisoned– usually in unsanitary conditions, sometimes beaten (most notably during the November 15 “Night of Terror” at Occoquan Workhouse), and often brutally force-fed when they went on hunger strikes to protest being denied political prisoner status. Women of all classes risked their health, jobs, and reputations by continuing their protests. One historian estimated that approximately 2,000 women spent time on the picket lines between 1917 and 1919, and that 500 women were arrested, of whom 168 were actually jailed. The NWP made heroes of the suffrage prisoners, held ceremonies in their honor, and presented them with commemorative pins. Women went on publicity tours dressed in prison garb and talked about their experiences in prison in order to win public support for their cause. January 9, 1918. The next day, it passed in the House of Representatives and on June 4, the U.S. Senate endorsed the amendment. The enactment of the amendment initiated a 14-month campaign for ratification by 36 states. During this time the NWP sent national organizers into key states to help local NWP members coordinate ratification efforts. Finally, on August 18, 1920, Tennessee became the 36th state to ratify the 19th4Amendment. Anti-suffragists tried to overturn the vote, but after six more days of legal maneuvering, the Tennessee governor signed the certificate of ratification and mailed it to Washington on August 24. Two days later, on August 26, Secretary of State Bainbridge Colby signed the 19th Amendment into law. I am participating in this year’s Nation History Day, and my history teacher is requiring that we conduct an interview with someone who is either a witness or scholar on our topics. My topic is Alice Paul and the National Woman’s Party, and I was wondering about the level of education you have received on the topic? If you would be willing and available, I would be pleased to have an interview with you via email or even online video chatting. Please email me via my given school email, as soon as time permits. Hello! I have some information for you, but your school email system won’t let my message through. Please write me from another address and send it to: LibSWHP@vcu.edu Hoping to hear from you soon! This is so helpful! Thank you! I was just wondering what the significance of the National Woman’s Party was; it’s doing a school report. Thanks! My great Aunts Mother, Mary E. Brown was one of the jailed suffragettes in Washington DC to receive a commemorative pin. I have that pin, it is a cell door pin. I also have Mary Brown’s diaries and personal letters as well as newspaper articles and a telegram that she sent while she was in prison. I find this so fascinating! Thanks for asking! Actually, my legal name is John, but my nickname since birth is Jack. I thought Alice Paul was the chair women for the NWP in 1916? Becca: You asked who is the author of the entry “Naional Woman’s Party?” I am the author, using information from the sources noted. Thank you, John E. Hansan, Ph.D. Thank you. This was a very helpful article. It would be even more helpful if you gave yourself credit at the top of the article. How long did you study Alice Paul and the National Women’s Party and for what purpose did you study them?